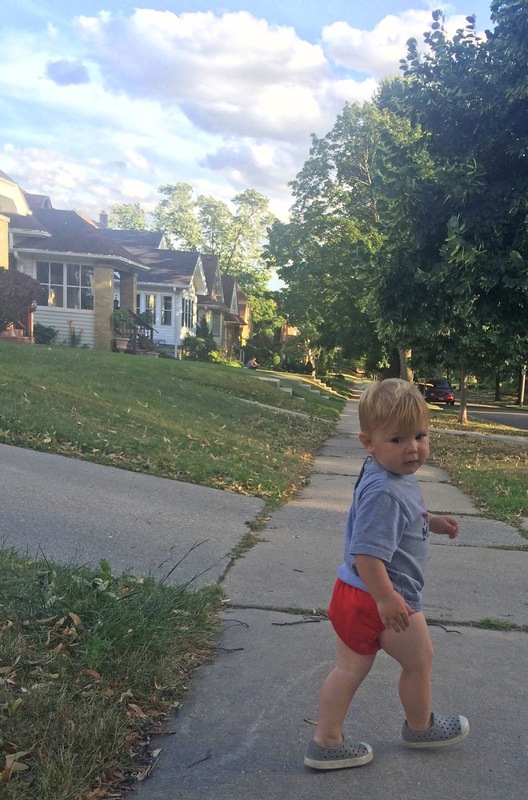 When I was pregnant with Callum, I had zero intention of cloth diapering with him. It sounded way too gross and like way too much work. But, then, about a month before he was born, a friend handed off her collection of BumGenius 4.0 pocket diapers. Since they literally fell into our laps, I decided we had to at least give it a shot. I began looking for washing instructions, and I was totally overwhelmed. It all seemed so complicated. After experimenting with several ways of washing and cleaning, I have to tell you, it's not. Plus, using cloth diapers saves us a ton of money and decreases our carbon foot print quite a bit. Not too mention, cloth diapered butts are way cuter than disposable diaper butts. We have a collection of about 30 diapers, the majority are BumGenius 4.0 pockets, but we also have a few Alva Baby pockets, too. I try to do a load every 3-4 days. So, I'm probably washing about 12 - 15 of them at a time. Full disclosure: We do put Callum in a disposable diaper overnight. Whenever we put him in cloth for the overnight stretch, it always seems to leak. We've tried using multiple inserts, but it still doesn't seem to pack enough punch for the overnight wetting. After a diaper change, if it's just a wet diaper, I simply pull the insert out of the diaper and throw the diaper and the insert into a garbage can we have lined with a large wet bag. For the No. 2 diapers, we have this sprayer attached to our toilet, and use it to rinse the waste into the toilet. If you are going to cloth diaper, I totally recommend getting a sprayer. It was very easy to install, and it makes washing so much easier. We're essentially giving the poopy diapers a cold soak before washing them, preventing stain and stink issues. After the poopy diaper is rinsed with the sprayer, I throw the pocket and cover into our wet bag with all the other diapers. Here's the sprayer attached to our toilet. There is an on/off valve for it located under the tank on the left hand side. When it's time to wash, I dump the diapers, wet bag and all, into the wash. For a detergent, we always, always use Tide. Whenever we've tried an off-brand or cheaper detergent, it never seems to get the ammonia smell out as well as Tide does. I've even had a couple of friends say that the BumGenius diaper detergent doesn't work as well as Tide. So, get Tide! It's totally worth it. I have my washing machine's water temperature set at a hot rinse and a cold wash.
On to the drying: We line dry and let the diapers sun whenever we possibly can. The sun really, really helps to bleach the diapers and get all of the ammonia out. If you are one of those lucky son-of-a-guns who can line dry year round, do it! You would not believe the difference I notice in our summer washes versus winter washes. 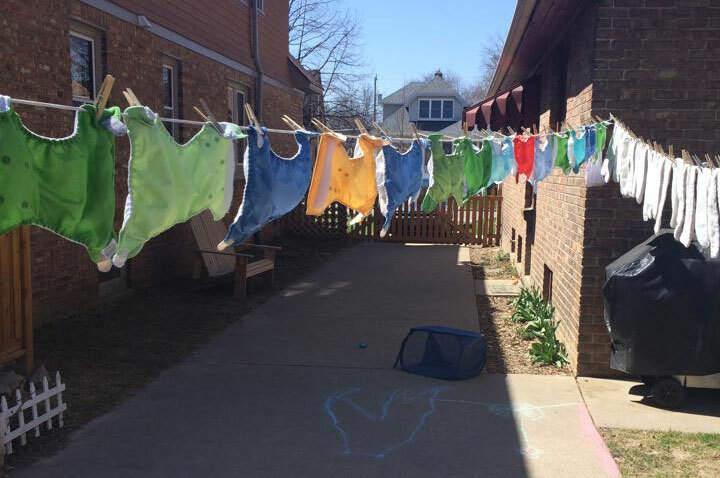 If line drying is not possible all the time (which, for us, it isn't), then the diapers are fine on a normal run through the dryer, without any softeners or dryer sheets. Also, I'm not sure if there's any truth to this, but I've always heard to dry the diaper covers horizontally (like in the picture below). It's supposedly much easier on the elastic. About once every three months, or whenever I notice a build up of ammonia (which is much more frequently whenever I'm not line drying), I'll soak my diapers overnight in my washing machine with hot water, Tide, and about half a cup of bleach. This is essentially stripping the diapers, and there are many ways to do it. The overnight soak in Tide and bleach works the best for us, and I think, is the easiest. After the soak, run your washing machine as you usually do. I've read that some people use Dawn dish washing soap to strip their diapers. THIS WILL RUIN YOUR WASHING MACHINE. Do not use Dawn in your washing machine. Just don't. We have both snaps and velcro diapers. Although the velcro makes changing the diaper quicker, I much prefer the snaps. They seem to leak less and to last much longer than the velcro. I'd like to have our velcro diapers converted to snaps. Does anyone have any good tutorials on how to do this? Or where I can get it done for cheap? I've heard that a BumGenius diaper (without an insert) works as a swim diaper. I've never tried this in an instance where Callum has pooped, so I can't verify for certain that it works. But, it totally makes sense. Definitely worth a shot if you're just splashing around in your backyard. If you are cloth diapering an infant that is only eating breast milk, you can throw the entire poopy diaper into the wet bag and skip rinsing it. Breastmilk-only poops are water soluble and do not need to be rinsed before going into the washing machine. I've never typed "poop" so much in my life. And that's about it! See, it's really not that difficult. 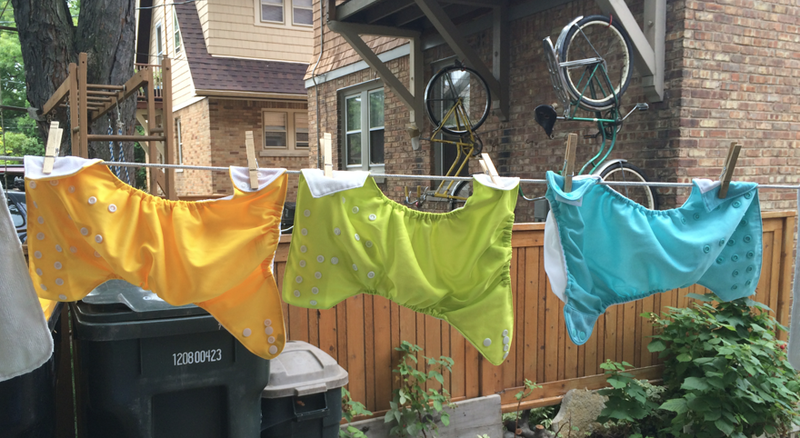 Once you are in the cloth diaper routine, it really is a cinch to clean them. We definitely plan on cloth diapering until Callum is potty trained, and will plan on it for any other babies we may have some day. Do you have any tips that missed? Any questions? Comment on the post and let me know!